Four people in black hoodies were seen throwing filled balloons at the Lambda Chi Alpha fraternity house on Foothill Blvd. 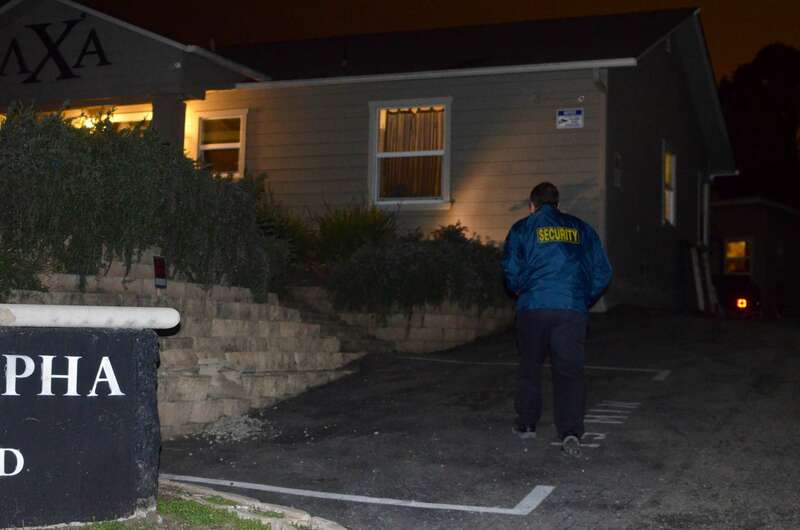 at 11:45 p.m. Monday night, according to San Luis Obispo Police Department (SLOPD) Patrol Lieutenant Brian Amoroso. According to Amoroso, the balloons were filled with a mixture of water and black paint. SLOPD arrived at the scene at 11:48 p.m. April 9. The hooded figures were caught on camera, but SLOPD did not catch any of them. As of April 10, a guard hired by Lambda Chi is posted outside of the fraternity house. The guard confirmed he was hired by the fraternity, but would not give Mustang News further information. This is following a protest outside the Lambda Chi house Monday evening. After a contentious Interfraternity Council meeting, protesters marched to the Lambda Chi house, calling for members to come outside and speak about their member dressed in blackface. SLOPD was called to the house four times April 9. According to Amoroso, SLOPD will continue to patrol around the area tonight.